The RB2011UiAS-2HnD-IN is a small form factor Ethernet router with 5 Gigabit Ethernet ports, 5 Fast Ethernet ports and an SFP cage. The RB2011Ui is a low cost multi-port device series designed for indoor use. The RB2011 is powered by RouterOS, a fully featured routing operating system which has been continuously improved for fifteen years. Dynamic routing, hotspot, firewall, MPLS, VPN, advanced quality of service, load balancing and bonding, real-time configuration and monitoring - just a few of the vast number of features supported by RouterOS. The RouterBOARD 2011UiAS-2HnD has most features and interfaces from all the MikroTIK Wireless routers. It’s powered by the new Atheros 600MHz 74K MIPS network processor, has 128MB RAM, five Gigabit LAN ports, five Fast Ethernet LAN ports and SFP cage (SFP module not included!). 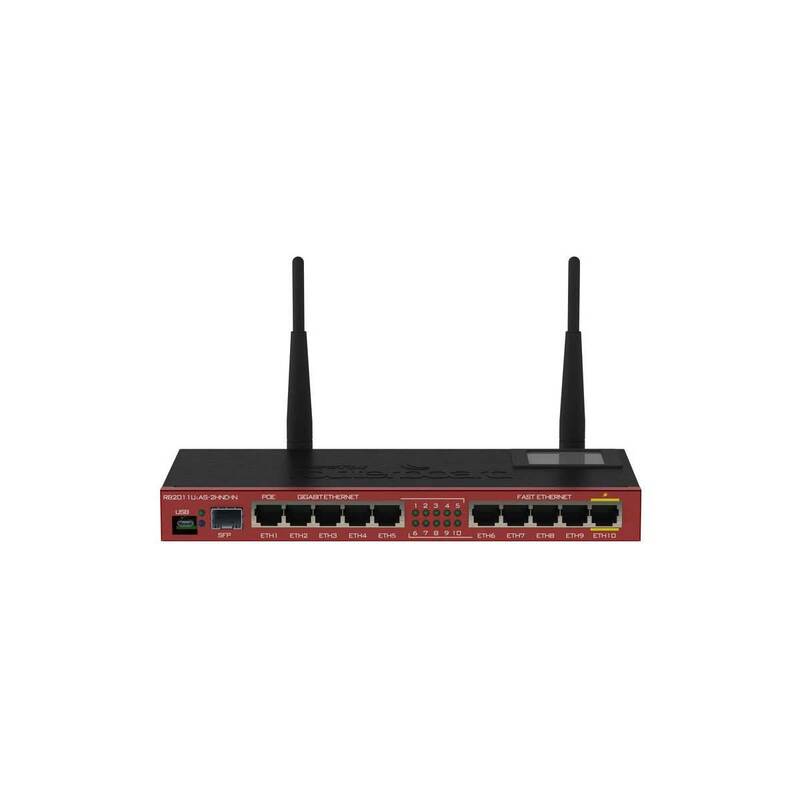 It also features powerful 1000mW dual-chain 2.4Ghz (2312-2732MHz depending on country regulations) 802.11bgn wireless AP, RJ45 serial port, microUSB port and RouterOS L5 license, as well as a desktop case with power supply, two 4dBi Omni antennas and LCD panel. Tested and recommended to use with MikroTik SFP modules: S-85DLC05D, S-31DLC20D and S-35/53LC20D (not included). The RouterBOARD 2011UAS-2HnD-IN comes with a desktop enclosure, LCD panel and power supply. The RB2011Ui also has passive PoE output capability on the last port (ETH10), this means you can power another device just by connecting it over a regular Ethernet cable.